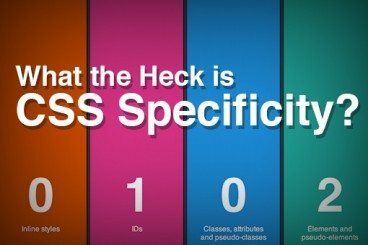 What the Heck Is CSS Specificity? CSS specificity is a topic that many new front end coders avoid for as long as possible. It sounds complicated, there are all of these rules, you might even have to do some math! How lame is that? Ultimately, you can only avoid it for so long. Specificity is an essential concept that you need to grasp to be an effective developer. Today I’ll walk you through the concepts of specificity in a simple and easy to understand manner. It’s easier than you think! Specificity is a funny word, right from the outset it communicates the idea that this is going to be complicated. Fortunately, its bark is bigger than its bite. There’s no reason that you can’t pick most of this stuff up in a few minutes or less. To break the practical application of specificity down into something that anyone can wrap their mind around, let’s use a familiar metaphor. When you were a kid, the world was a much cooler place. If given the opportunity to ask one and only one question to an all knowing entity, you would not have pondered the meaning of life or ventured forth a query about whether or not world peace is attainable, only one thing would matter. If Batman and Spiderman got into a fight, who would win? ScrewAttack writes huge pieces dedicated to pitting heroes against each other. There’s this innate curiosity in children to constantly compare things and ask which is better. As we grow older, shades of gray replace black and white and we lose this tendency (we nerds are of course an exception). To understand CSS specificity, you should revert to childhood. When given two similar selectors, always ask yourself, “Who would win in a fight?” The answer could prove critical to the way you code. To see how this works, let’s pit a few selectors against each other and see what happens. For our first battle, let’s pit two essentially identical selectors against each other. How do we know which selector would win? Here the square is blue because the “.blue” class came last, overriding the “.box” class. That last battle wasn’t very interesting. The opponents were too equally matched and the outcome was obvious. We haven’t even really scraped the surface of specificity yet. Nevertheless, that was a necessary foundation that needed to be laid. Now we’ll dive into a battle that’s a little more juicy: ID vs. Class. Given the rule that we learned last time, you might predict that the class would win in this scenario. Let’s see if that proves true. An upset! Even though the class came after the ID, it still lost. This indicates that IDs are somehow stronger than classes in the battle of specificity. Before we jump in to see how all of this works, let’s look at one final example. We’ll ramp up the complexity here so you can begin to appreciate how this knowledge can be applied in a real world situation. Oh snap! I’ll bet this one even trips up some of the experienced readers. Many of us don’t even know the difference between the two, much less which one wins a specificity death match. Let’s get this party started. The pseudo element takes it! The pseudo class didn’t stand a chance. But why? What behind the scenes voodoo is taking place here? How can we be sure of the outcome before we even try it? Trial and error is a great way to learn, but ultimately there are just too many different possible scenarios to run through to glean all of the information that we should know. What we need is a hard and fast way to decide which selectors the browser places more importance on and why. A given CSS selector can have any number of the pieces of this puzzle. The trick to figuring out specificity is to add them up. The one with the highest score wins. It’s that simple. Nobody likes math though, so to test the specificity of a selector, we can use the awesome specificity calculator on Keegan Street. With this great tool, we can type in two selectors and a score for each will automatically be calculated. The first selector in the example contains one class, one pseudo-class and two elements (score: 0,0,2,2). The second selector beats it hands down with one ID, one class, one pseudo class and one element (score: 0,1,2,1). The rule here, as you can see, is that the selector with the highest degree of specificity wins. In other words, more specific selectors trump less specific selectors. Given our previous example of a class vs. an ID, we can see why the ID wins. Its specificity is far higher than that of the class, so it overrides the class. Given the specificity calculator, we can figure out most scenarios, but there are a few curve balls that we need to keep in mind. Simple enough, right? Using our point system, the class scores higher than the element, so the headline will come out red. But what if we toss Superman into the scenario? Now we’ve rigged the fight. In this case, the headline actually comes out blue! The !important rule says, “screw you specificity” and does what it wants. Now that you understand specificity, you’ll be able to manipulate your CSS to do a lot of crazy things. Just remember that with great power comes great responsibility. In CSS, the general rule is that less is more. The shorter your rules, the better. Never use .list ul > li > a when li a will work just fine. Shorter selectors are more efficient and easier to read. Sometimes you have to get fancy, but let that be the exception, not the rule. Wait a dang second. The rules were supposed to explain the results that we received in our initial tests, weren’t they? So what about this one? As far as I understand the rules, a pseudo class beats a pseudo element, so why does the pseudo element win here? Maybe we’re wrong about which is the pseudo element, let’s check our chart. As far as the calculator is concerned, the headline should be blue because first-child beats first-line. But that’s not how it works in the browser. What gives? Maybe our calculator is broken, let’s try another one. According to this one too, first-child should have a higher specificity value and should therefore win… but it doesn’t. I’ve tried using the single colon syntax, switching the order; nothing works. The pseudo element always wins, no matter what I throw at it. This is where it really gets nuts, even if I toss in an inline style element, which should beat almost anything, the dang thing still comes up red! Conceptually, this almost makes sense. Our pseudo class is targeting the entire h2 element while our pseudo element is targeting only the first line of that element, which seems more specific. To be blatantly honest, I’m a little baffled here. For the most part, specificity is pretty straightforward, but I can’t seem to wrap my mind around this one. My instinct is that it’s perhaps some sort of inheritance issue, but I’m not sure. It might also be something similar to :not() which has special significance in regard to specificity (only the items in the parentheses count, by itself it’s a zero). In response to our little puzzle, here are some helpful answers from readers! As we just saw, CSS specificity is super simple, except when it’s super complex… You can and should learn the basics so that you can avoid any unexpected results, but when it comes down to it, some good old fashion trial and error might be necessary if you come across a sticky situation. What do you think? Do you understand specificity as much as you should? Can you explain the puzzling scenario that we ran into above?